I just got an email from King Arthur Flour advertising free shipping on 50 favorite ingredients. I thought I’d highlight the products that I love that are included in the deal. And no, I don’t get a dime from any of these links (wish I did), but I love this company and its products. This sale ends Thursday, August 26th. KAF Unbleached All Purpose Flour – The only AP flour I use, and one of the only brands of flour I use, period. (White Lily still wins for biscuits, sorry.) Caveat: Even though it’s their own flour, I can get it for $3.99 at my local grocery store, sometimes cheaper on sale. If you can’t find the flour near you, then by all means order it and see what you think. Fiori Di Sicilia – Don’t ask me to pronounce it, but this extract is like an amazing combination of vanilla and citrus and floral notes. It needs a simple sugar cookie recipe to really shine. If you’re feeling adventurous and love to bake, try this extract. Pizza Dough Flavor – This is a blend of cheese, garlic powder and other seasonings that you add to the dough when you’re making homemade pizza. It just gives it a little extra oomph and flavor. Great for garlic bread or breadsticks, too! 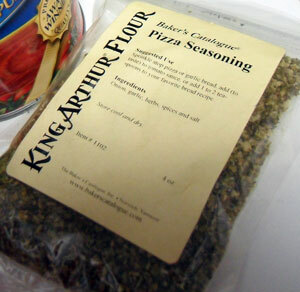 Pizza Seasoning – I’m on a pizza kick. We’ve had it two nights in a row so far and finishing leftovers tonight. I make the tastiest and quickest pizza sauce with about a teaspoon of this blend in a 28oz can of Progresso Tomato Puree. With a splash of olive oil. Done! Coconut Flavor – Every year at Thanksgiving I make Paula Deen’s coconut cake. I consider this extract my secret ingredient to real coconutiness. Great in coconut chocolate chip cookies too. Ooh, and coconut cupcakes. Vanilla Bean Paste – While any of the vanilla extracts that are on sale would be good, too, I love this vanilla paste. I think it has a more pronounced vanilla flavor and aroma, and you get the little flecks of seeds in your ice cream or pound cake. Save it for the recipes where vanilla’s the star. So now that I’ve told you some of mine, what are some of your favorite ingredients? Oh wow! Pizza dough flavor may have to be ordered. I love your site layout and name. I am going to have to take a look around! Thanks so much for stopping by my blog! I look forward to seeing kitchenstuffilove.com grow!! Get the pizza seasoning too! It makes it so quick and easy to put together pizza sauce. Thanks for dropping by. We are in early stages but I’m excited about the blog. Hope to see you again! Wowee! My blog has been touched by celebrity! I recognized your name from the catalog, PJ, thanks so much for dropping by! And you’ve pointed out products I’ve seen but never tried. I will have to add them to my list. Especially the natural fiber. I know I need more of that in my diet. Do y’all have an affiliate program? I’ll be recommending you bunches (I couldn’t live without the parchment half sheets), so it’d be great to get a little something in exchange. I’ll link to you regardless, but please think about it if you don’t have one in place. Thanks!